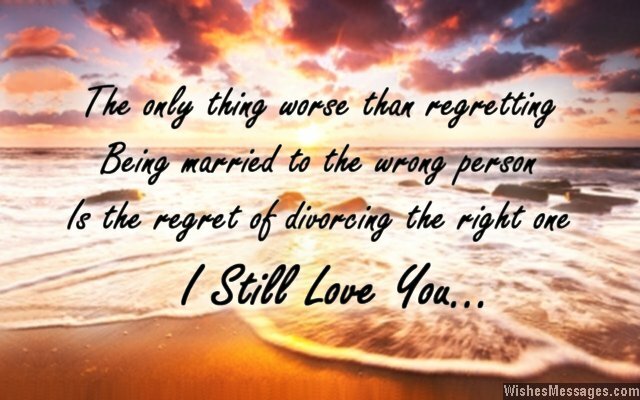 I love you messages for ex-husband: Life’s nasty twists and turns often lead to bad decisions and separating from your husband may very well be one of them. You will be able to relate to these heartbreaking quotes if you are regretting the fact that your family is broken. Without a doubt, you should have thought about the future and the lives of your children before you walked away. If you think that you want to rekindle your relationship with your ex because you still love him, be well aware that mending a divorce will pan out to be much harder and dirtier than getting it in the first place. 1) My mind refuses to call you my MISTAKE. My heart refuses to call you my EX. My soul refuses to call you my PAST. 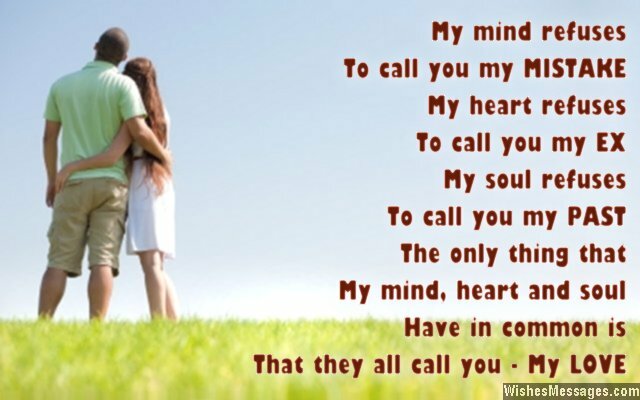 The only thing that my mind, heart and soul have in common is that they all call you my LOVE. 2) How ironic it is that when we were married, we spent all our time thinking about the weaknesses our marriage had. Now that we are separated, I am spending all my time thinking about the strengths our marriage had. I love you. 3) I don’t want to be just nice to you, I want to love you. I don’t want to be friends with you, I want to be your lover. I don’t want to be your ex, I want to be your everything. 4) Our wedding bands are desperately waiting to be on our fingers again and I am desperately waiting to be in your arms again. I love you. 5) Marriage and Divorce may be powerful words in the court of law but LOVE is the only ruling in the court of my heart. I love you. 6) Our divorce is my repentance, our reunion will by my reward. I love you. 7) The word HATE can be rearranged to spell HEAT. Can you still feel the heat between us? I love you. 8) Living in the past is not a good thing. But that is the only place where I can find you. I love you darling. 9) My recurring nightmares are not about losing you, but about never being able to get back with you again. I still love you. 10) Nothing in the world can change the fact that you will always be the keeper of my soul, protector of my heart, nurturer of my dreams and custodian of my life. 11) To my ex-husband: It is high time you come back and reclaim what is yours – me. I love you. 12) Ironically, spending time away from you made me realize that the time I spent with you was the best time of my life. I still love you. 13) I don’t deserve your hate, I deserve your heart. I don’t deserve your anger, I deserve your affection. I don’t deserve your spite, I deserve your soul. I love you. 14) It is true that I don’t want our children to see mommy and daddy living apart. But more importantly, I don’t want petty differences to tear our love apart. I love you. 15) I don’t want to be the ex-wife you conveniently forget. I want to be the ex-wife with whom you fall in love again and remarry. I love you. 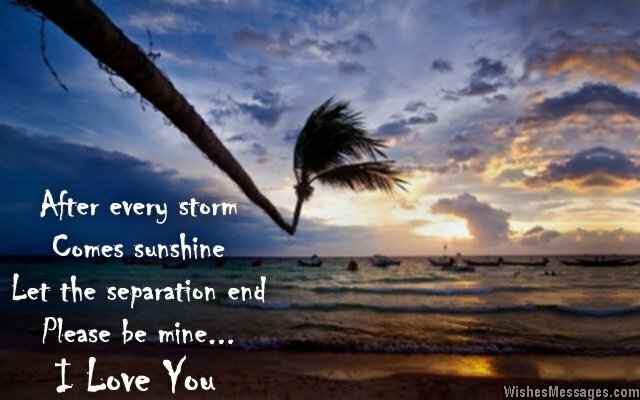 16) After every storm, comes sunshine. Let the separation end, please be mine. I love you. 17) Forgiveness is one of the many promises you made to me on our wedding day. I know that you will keep your promise. I love you. 18) Our divorce has changed my marital status to SINGLE, but it hasn’t been able to change the status of my heart from MARRIED. I love you. 19) Move on – these words will never exist in my dictionary. I still love you. 20) When we separated I thought that I was undoing the biggest mistake of my life but in fact, I was actually making the biggest mistake of my life. I love you. 21) Divorce may have been written in our destiny. But that can easily be fixed with some rewriting and proof reading. I love you. 22) My lies were the reason for our separation but I still haven’t managed to stop lying. I am still lying to myself that you will come back to me. I love you. 23) Let’s get back together, let’s laugh again, let’s be free again, let’s see things differently – let’s start living once again. I love you. 24) Unbreakable, Invincible, Unstoppable – let’s make this the tagline of the movie called Our Married Life. I love you. 25) I don’t need to get you out of my mind. I need to get the LOVE out of my heart and transfer it into yours. I still love you honey. 26) I don’t want to be the woman who isn’t your wife anymore. I want to be your wife who isn’t going to hurt her husband anymore. I love you. 27) The best mistake I have ever made in my life is to fall in love with the same man twice – YOU. I still love you. 28) Our divorce has changed everything between us, except one single fact which is the most important one – I love you. 29) Let’s put an X on calling each other ex-husband and ex-wife. I love you. 30) I have always believed that every sorrow is followed by joy so deep down in my heart I still have hope that our separation will be followed by getting back together again. I love you. 31) The only thing worse than regretting being married to the wrong person is the regret of divorcing the right one. I love you. 32) I give up, I can no longer pretend. I still love you, let’s get back together again. 33) Our marriage may have been a shipwreck but we both can still be rescued out of the waters of despair by a lifeboat called LOVE. I still love you. 34) It didn’t take any courage to fall in love with you when we met for the first time. I took a little courage to separate from you when our marriage went sour. But it is taking me a lot of courage to accept that I still love you and want to be your wife again. 35) Our little son asked me ‘Mommy, does daddy know you still love him so much?’. I replied ‘I don’t know dear… but I’m going to do everything to let him know’. This Mommy still loves you like crazy.